There are many different solutions available but two platforms tend to stand out among the rest: WooCommerce and Shopify. Combined, they have nearly 4 million companies using their systems, but what makes them so popular? Let’s start by looking at what you need from an eCommerce platform in order for you to be able to run a successful online business. The process of choosing an eCommerce platform begins by thinking about what you’re selling, how you’re selling and how you would like to expand in the future. Knowing these things will allow you to choose which of these two giants is the right platform for you. How many products are you looking to sell on your website? And how will this grow in the future? How tech savvy are you? Are you able to handle the purchasing of your own hosting, domain and software installation? How are you going to market the website? SEO? Pay-Per-Click Ads? Email marketing? Will you be managing your website? Will more than one person be managing it? Are you looking to automate the process as much as possible? Would you prefer ease of use of more control over your website? What’s your price range? Would you prefer to pay more up front or would an ongoing payment structure be more suitable for you? Once you have idea of what your answers are to these questions, you can begin to compare the Shopify and WooCommerce platforms and see how they stack up. WooCommerce is one of the most commonly used eCommerce platforms on the internet with over 3million active installs in online stores. It’s typically one of the first names that will come up when you begin to search for the options for your eCommerce store. WooCommerce is built on top of WordPress, which makes it possible to get a basic site up and running using only WooCommerce, WordPress and a free theme. The only costs that are associated with this would be hosting and a domain for your website. This leads to minimal effort and cost to yourself to get your site up and running. Of course, WooCommerce will be suitable for a wide range of purposes out-of-the-box but it’s likely that there will be some things that you require that aren’t included. If you want a more premium look for your website, ThemeForest has over 1,000 paid themes for WooCommerce that you can easily install yourself. If you are looking for some more functionality, CodeCanyon has over 1,500 plugins for WooCommerce that will allow you to do just about anything with your website. Additionally, WordPress has an incredible number of plugins and combined with what is on offer for WooCommerce, you should be able to add in just about any feature you could ever want for your online store. If you need something for your website that you can’t seem to find or add yourself, both WordPress and WooCommerce are incredibly friendly for developers to work with. There are plenty of options for developers who are ready to work with WordPress and will be able to help you out. You can probably even find one that lives in your town or city! This will allow you to customise your website to do whatever you want it to do and adjust it over time to suit your changing requirements. This is one of the downsides to making an eCommerce website with WooCommerce is that it will be a lot of work initially. Of course, there is plenty of support available but you need to learn a lot in order to get your site going. Other platforms are simplified to make things easier for beginners and WooCommerce/WordPress are designed to give control to developers. An upside of this is that you can potentially set up your own full site without ever having to work with a developer. You just need to take the time to figure out how everything works on your own. There are a large number of resources available to help you to get everything sorted on your website, so you’re not alone. You can get on happily with hundreds or even thousands of products with WooCommerce, but if you begin to exceed these numbers it will become difficult for you to continue scaling your business without some extra help. This will require you to move your website to a server that performs better, utilise Content Delivery Networks and work alongside a professional developer to optimise your website. While this is typically what you need to do with most eCommerce platforms, Shopify has a built-in scalability factor into their pricing model. So, how does Shopify compete with WooCommerce? The Shopify platform is explicitly built for online stores rather than being available as an extension for multi-purpose platforms like WordPress. This does, however, mean there are some options you will have to trade-off: it is more difficult to create adjacent functionality like information pages and a blog, but it is much easier for you to manage your store. Let’s see what it has to offer. WooCommerce allows you to set up a functional online store for almost no cost. If you choose to go for a more premium theme, there may be some cost there but Shopify has chosen a different model – subscriptions. The pricing of Shopify ranges from $29 to $299 per month but it does come with a number of benefits. Some of these include discounts on shipping, regular updates, inclusion on Shopify’s own Content Delivery Network and an in-store POS solution. One benefit of not managing your own hosting is that it’s possible to constantly increase the number of products on your online store. However, if you experience a massive amount of traffic or need to add additional items to the management of your store, you will need to upgrade your account and Shopify will handle it for you. This allows you to spend more on the business itself and less time worrying about the actual infrastructure that lays beneath your website. WooCommerce is much more widely supported than Shopify, but there are still plenty of guides themes and apps available to suit your needs. The diversity of these resources is just much slimmer than that of WooCommerce. This does lead to a slight lack of diversity for stores running on the Shopify platform as there is a smaller, niche user base than the WooCommerce/WordPress combo. Additionally, there are tens of thousands of themes available for WordPress and Shopify has roughly a tenth of that selection. This is again true for apps (or plugins in WordPress speak). For example, if you are looking for an app to help with your SEO, there are a few dozen available for WordPress, whereas Shopify only has a few to choose from. 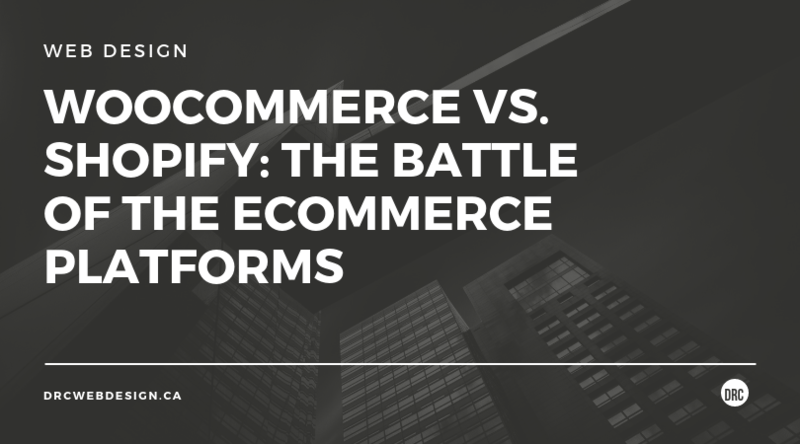 So, who wins in the battle of WooCommerce vs. Shopify? To answer this, you need to look at your specific needs from the questions we asked you at the beginning of this blog post. After reading through the pros and cons of each, which one do you think best suits your needs?For in-depth control and low up front costs: WooCommerce is the solution for you. For ease of use and scalability: Shopify is the better solution for you. We can’t tell you which one to decide as they each suit different needs but it’s worth working out which one suits your business the best before taking the plunge with either one.